$30.00 In stock. Order in the next 16 hours, 6 minutes and it will go out today! Smaller Housing - takes up even less space on your keychain. Plus - added some handsome lock icons to give it an even more realistic look. Longer Cable - increased it from 18" to 24". 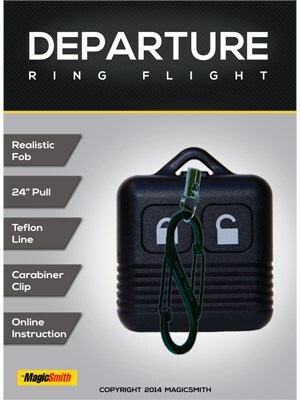 This allows you to display the ring even further away from you body before the vanish. Also good if you like to perform wearing a jacket. Extra Bushing - There's an extra bushing on the housing where the cable emerges to cut down even more on friction. Friction is the enemy of a good flight. A really nice effect! The quality is very nice for the price! I love that I can keep it with me at all times!